FIVE STARS: Utterly Sensational. A basic book for humanity. I cannot say enough good things about this book. What Tom Atlee is writing about is just about the most important thing that's happening at the beginning of the twenty-first century. I've been a fan of Tom Atlee's for years. He paints a vision not of some distant, ideal democracy but of here-and-now practices showing us what's possible in our immediate future. In The Tao of Democracy he describes how we really can use citizen dialogue and deliberation powerfully to solve our common problems and meet deep human needs. What an important gift for our small, challenged planet! The Tao of Democracy provides clear evidence that we already have the resources and wisdom we need to confront even the most difficult challenges. It calls on us to access our collective intelligence to create the futures we want rather than being forced to live with the futures we get. Tom Atlee breaks lots of new ground with a highly intelligent, original proposal for reinvigorating democracy in a manner that is fully consistent with the emerging global wisdom society. The Tao of Democracy is for all people who want a better world than we have now, and need a dependable way to get there. Here is a book that explains how 'We the People' can build our collective capacity to see clearly where we're going and govern ourselves wisely. It describes how we can break through to conscious evolution and to co-creating a shared future that makes sense to all of us. Order The Tao of Democracy today. to creatively address our 21st century problems, opportunities and dreams. Click here for published reviews of The Tao of Democracy. 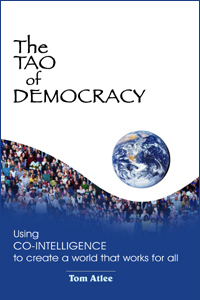 Order The Tao of Democracy through this site or from your local bookstore.